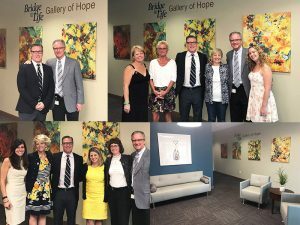 Bridge to Life, a partner who specializes in preservation solution for the transportation of organs, has sponsored the new Gallery of Hope at Lifebanc. The gallery is the perfect finishing touch on the Donor Family Comfort Room, located in the new Lifebanc Donor Care Facility. The comfort room will allow families to be as close as possible to their loved-one throughout the donation process. The gallery features the work of two artists touched by organ, eye and tissue donation. The series of paintings hung on the beige wall, were created by Marlene Lewis. Marlene’s sister was a recipient of a heart-lung transplant and inspired her to create these beautiful pieces. On the blue wall is a newly created work of art called “Possibilities” by artist Niki Litts, whose life was saved by a liver transplant decades ago. “The artwork brings a sense of calm and beauty to the comfort room where donor families will spend time while their loved-ones are giving the gift of life. What a beautiful tribute, by the artists, to these families and the impact their loved-one is making,” said Lifebanc CEO, Gordon Bowen. Lifebanc invited a few friends to help celebrate the completion of the gallery and the hope it represents to those waiting for a life-saving transplant. Marlene and Jessica Shay, Carolyn Galish as well as Linda Corea, donor family members attended the small gathering. Also joining the celebration was Tania Markarian, Lifebanc Board Member and recent top fundraiser for the Gift of Life Walk & Run, Debra Cooper, Chief Quality and Regulatory Officer, Heather Mekesa, Chief Hospital and Clinical Services Officer and Colleen Murnane, Lifebanc Board Member. Thanks to Bridge to Life, the Donor Family Comfort Room will truly be a starting point for healing and hope for these hero families.